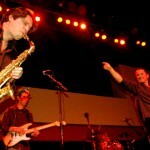 With a fresh new perspective on contemporary jazz, Scott Paddock has redefined the sound of the modern saxophonist. His soulful combination of jazz and funk create an explosion of high energy grooves that will make you fall in love with the saxophone all over again. Paddock has been surrounded by music his entire life. As the son of a band director, Scott had already attended Count Basie and Maynard Ferguson concerts by the age of 2. His defining moment came after hearing Michael Breaker for the first time at the JVC Newport Jazz Festival at the age of 12. At that moment, he knew exaclty what he wanted to do with his life and began practicing relentlessly. This determination was quickly recognized in the music community as Paddock began winning awards and becoming a constant fixture in the local newspapers. During Scott’s senior year of high school, the legendary jazz band composer/arranger Sammy Nestico was commisioned to do an arrangment of the old jazz standard “Lover Man” featuring Paddock and even incorported some of Paddock’s ideas. Paddock continued his musical studies at Shepherd University on a full scholarship. He studied classical music by day and played jazz and R&B by night. 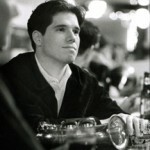 Scott’s musical influences range from Paul Creston and Charlie Parker to Marvin Gaye and Tower of Power. Paddock was steadily developing his own sound as well as becoming a stand out player in the Washington D.C./Baltimore music scene. 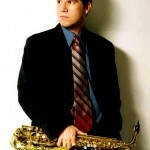 After college graduation, at the age of 23, Paddock was hired as a part time college professor, teaching saxophone. After a short stint in the education field Scott realized that he had to follow his true calling as a performer, so he packed all his belonging and moved to New York City and dove head first into the music scene. After a couple months of the NYC music grind, Paddock was on stage at jam sessions playing along side with such luminaries as Roy Hargrove, Eric Alexander and Ben Wolfe. After one such session, Paddock was approached by a listener who had connections in the cruise ship industry and a couple weeks later Scott was headed to Europe to perform on the Mediterranean tour of Holland America’s premier ship. While performing in the Mediterranean, The Tommy Dorsey Orchestra came aboard to play a big band cruise. When their musical director heard Scott performing at one of the shows, he was hired to tour the world with The Tommy Dorsey Orchestra. After 6 months with the TDO, Paddock realized his true dream was to be a solo artist and returned home to begin working towards that goal. Paddock set up shop in Baltimore, MD playing shows with many of the areas top players and still educating. 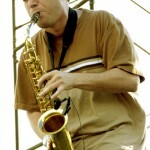 He wrote a jazz method book for saxophone titled Break it Down – Jazz Concepts for the Saxophone. In 2000, Paddock released his first CD “From Within” to rave reviews. “From Within” was on the play list of many local radio stations in the Baltimore/DC area, and received write-ups in magazines such as Jazz Times and Music Monthly. 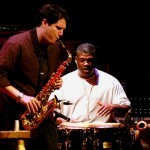 As the hype from his first CD continued to build Paddock found himself on stage performing as a soloist or doing section work for artists such as: Bela Fleck, Little Feat, Vesta Williams, Jackson Browne, Lenny Pickett, Billy Bob Thorton, Warren Haynes, Gary Grainger, Dennis Chambers & Sam Bush. In addition to his solo or section work with the above artists, Paddock also performed as an opening act for: Ray Charles, Gladys Knight, Leeann Womack, Bootsy Collins, Natalie Cole, Joan Jett & Jeffery Osbourne. As a well established musician, Paddock regularly performs at prestigious events and venues such as: The Capital Jazz Festival, The HFStival, Fed-Ex Field, The Kennedy Center and The Verizon Center. In addition to Paddock’s career as a performer, you will find him in the recording studio where he has played on over 25 CDs, and is a staff writer and first call saxophonist for the music production company Selectracks. Scott has done session work for major television networks and movie production companies including: ABC, FOX, NBC, UPN, BET, MTV, VH1, Universal Films, Artisan Entertainment, Focus Feature Films, Miramax Films, Dimension Films, Disney, Punk’d, Cold Case, Wolf Creek, Friday Night Lights and BGE. 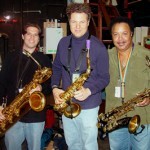 Paddock’s saxophone playing can be heard in theatrical and television releases featuring: Sean Penn, Ashton Kutcher, Drew Barrymore, Hillary Duff, Heather Locklear, Chris North, and Caroline Rhea. The next chapter in Paddock’s uprising career is marked with the 2007 release of his second CD Another Day. Another Day is comprised of 11 original songs that clearly define Paddock as a new leading voice as both a saxophonist and composer. His ability to cross genres with ease and take the listener on a musical journey helps Paddock stand out among jazz artists. 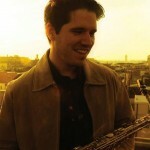 Scott Paddock is the future of the contemporary jazz saxophonist.